Siesta Key Beach weddings are an unforgettable experience. Thanks to its sugar fine, white sand, Siesta Key beach has earned the reputation of one of the best beaches in the country. This laid back beach town is the perfect place for people from all walks of life to unwind and take a break from their everyday life. 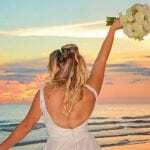 Siesta Key Beach Weddings provide you with beautiful sunsets, crystal clear water and our beautiful Florida beach wedding packages. Siesta Key beach is a short drive from Sarasota and offers museums, golf courses, wildlife, circuses, incredible shopping, delicious restaurants, and so much more. If you love watersports, spend a day at Siesta Key Watersports parasailing or jet skiing. For even more adventures, you can rent bikes, paddle boards, and more from the Adventure Tiki Hut at Tropical Breeze Resort. For some fresh and tasty seafood, grab a bite to eat at Siesta Key Oyster House or Gilligan’s Island Bar and Grill. At the end of the day, head on over to Siesta Village which is a vibrant area full of restaurants, bars, pubs, shops, and galleries that are all within walking distance of one another. Since the Village (Siesta Village’s local nickname) is located near many vacation rentals, you won’t have to travel far when you’re ready to catch some sleep. 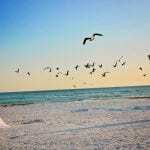 Siesta Key beach is a fun city with picturesque views and plenty to do. 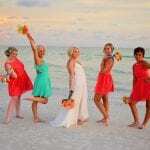 If you’re engaged and searching for the perfect wedding destination, consider Siesta Key beach. You can exchange your vows on one of the top-rated beaches in the United States while giving your loved ones a once in a lifetime experience. Let’s be honest. Hosting a traditional wedding at a local hotel or party center in your hometown is expensive. 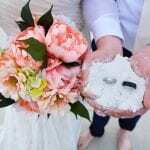 If you’re looking to save money without compromising the fun or beauty of your wedding, a wedding on Siesta Key beach is the way to go. Everyone including you, your fiance, your family, and friends deserve a vacation. Siesta Key beach weddings give everyone a good excuse to take some time off work and unwind in this incredible beach town. Siesta Key beach offers a beautiful backdrop that you likely won’t be able to find in your hometown. Picture saying “I do” on a breathtaking beach with your toes in the sand and your loved ones beside you. If you’re a laid back couple and are looking for something less formal, a wedding on Siesta Key beach is a wonderful option. You can dress comfortably and get married without any shoes. You’ll find that your guests have the time of their life because of the non-stuffy, relaxed vibe Siesta Key beach offers. Your wedding photos will be with you forever. The natural light paired with the beautiful backdrop of Siesta Key beach guarantees that your wedding photos will turn out better than you could’ve ever dreamed of. 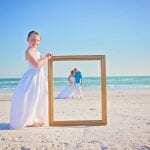 You’ll look back on your wedding photos years down the road and be glad you chose a wedding on Siesta Key beach. If you’d like to elope, the Simply Florida package is right for you. It’s created for weddings of eight guests including you and your spouse and ideal for couples searching for an intimate affair. This package comes with a photography session of 30 photos, an officiant, a natural bamboo canopy, and the legal filing of your Florida marriage license. For Siesta Key beach weddings that are still considered small yet have up to 35 guests, the Florida Nautical Knot package is a great option. Bamboo poles with your choice of two colors, a bamboo topper, white or ivory chair covers with colored sashes, and seating for up to 14 people are included in this package. Contrary to popular belief, large weddings don’t have to be stressful. With the Florida Destiny package, you’ll enjoy music, a bamboo canopy, and up to 24 chairs at your ceremony site. This is the right package for Florida beach weddings of up to 50 or more guests. Regardless of where you live, planning a wedding with us at Florida Beach Weddings is easy. You’ll begin by selecting a wedding package that caters to your budget and preferences. Then, you’ll reserve a wedding date and receive an information packet in the mail. The packet will include a contract, general timeline for your big day, and a worksheet asking you to fill in all of your crucial ceremony choices. On the week of your wedding, we’ll send you a detailed of agenda so you know exactly what we have planned for your big day. 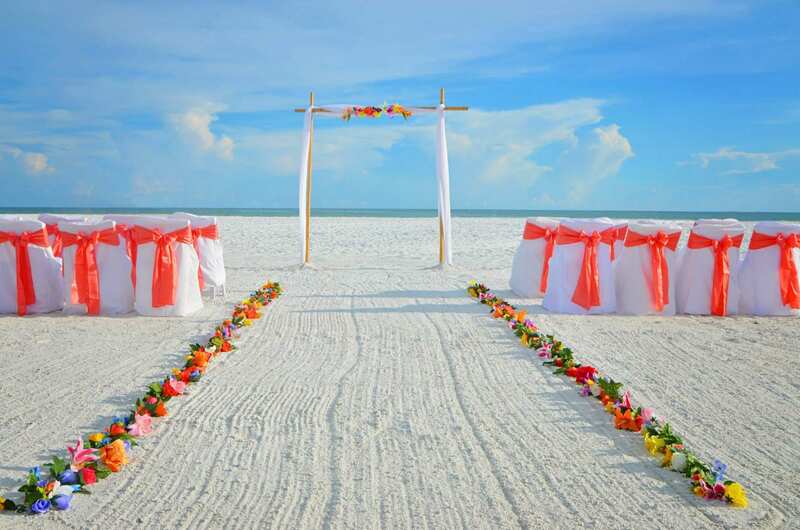 We encourage you to come to Siesta Key beach at least a few days prior to your wedding so we can show you the site of your ceremony and you can get acquainted with the area. When it’s finally time for your ceremony, you’ll be able to truly relax because we’ll take care of everything. 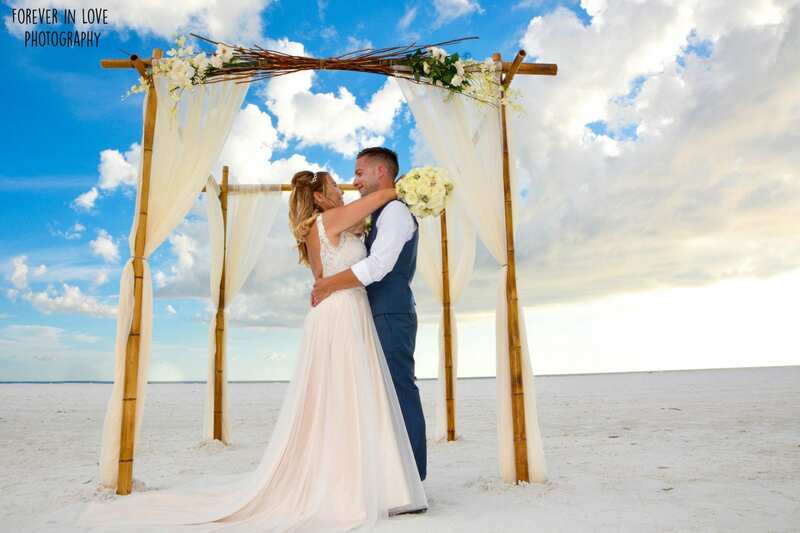 Are you intrigued by Siesta Key beach weddings and wondering whether you should host a non-traditional wedding in this incredible place? If so, we encourage you to browse our wedding packages and contact us today. 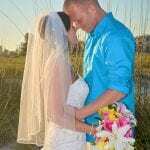 We look forward to showing you the magic of Florida beach weddings!